Below is a clipping from the newspaper "The Hour" published on September 24 1992. 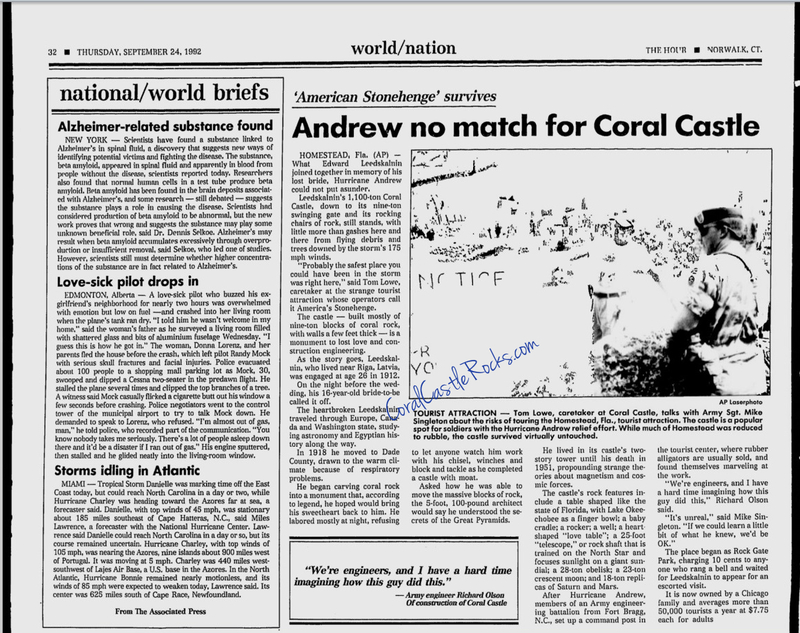 It is titled "Andrew No Match For Coral Castle". Who is Andrew? Hurricane Andrew! In August 1992, hurricane Andrew more popularly known as the ‘costliest hurricane in US history’ hit Homestead Florida with a vengeance. The entire city was devastated and almost all man-made structures were flattened to the ground. However, Coral Castle was barely touched. A blow-horn attached on top of the 3 ton gate had blown away and several trees had fallen down, but Ed’s megalithic castle was intact. What’s more interesting, when the Government realized Coral Castle was indestructible, they immediately put it to use - they stationed their battalion in the castle to cleanup and rebuild the area. They recognized this was the safest place in the city and officials made it their temporary quarters. I think it is safe to say Coral Castle will remain forever, unlike modern buildings built with "state-of-the-art" technology.